For the socioeconomic idea, see Spoon class theory. 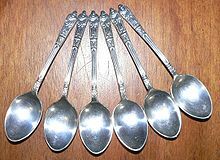 The spoon theory is a disability metaphor (for a combination of ego depletion, fatigue, and other factors), a neologism used to explain the reduced amount of mental and physical energy available for activities of living and productive tasks that may result from disability or chronic illness. [a] Spoons are a visual representation used as a unit of measure in order to quantify how much energy a person has throughout a given day. Each activity requires a given number of spoons, which will only be replaced as the person "recharges" through rest. A person who runs out of spoons has no choice but to rest until their spoons are replenished. This metaphor is used to describe the planning that many people have to do to conserve and ration their energy reserves to accomplish their activities of daily living. The planning and rationing of energy-consuming tasks has been described as being a major concern of those with chronic and fatigue-related diseases, illness, or conditions. The theory explains the difference between those who don't seem to have energy limits and those that do. The theory is used to facilitate discussions between those with limited energy reserves and those without. Because healthy people typically are not concerned with the energy expended during ordinary tasks such as bathing and getting dressed, the theory helps healthy people realize the amount of energy expended by chronically ill or disabled people to get through the day. Spoons are widely discussed within autoimmune, disability, mental and other chronic illness online communities, as an emic descriptor. The term spoonie is sometimes used to refer to a person with a chronic illness that can be explained with the spoon theory. ^ It is not a theory in the scientific or mathematical sense, but this is what the concept has been known as since its origin. ^ "Explaining Low Stamina Levels – with Spoons". BBC Online. 21 June 2013. Retrieved 28 November 2017. ^ Henderson, Wendy (29 June 2017). "Explaining Chronic Illness: An Alternative to the Spoon Theory". Multiple Sclerosis News Today. ^ a b Miserandino, Christine (2003). "The Spoon Theory". But You Don't Look Sick. Retrieved 5 July 2017. ^ a b Band, Emily (24 September 2012). "How the Spoon Theory Helps Those Suffering Chronic Pain and Fatigue". The Guardian. London. ^ Alhaboby et al. 2017, p. 6; Alhaboby et al. 2018, p. 177. ^ Hess, Amanda (4 March 2016). "The Social Media Cure: How People with Chronic Illnesses Use Memes, Selfies, and Emojis to Soothe Their Suffering". Slate. Retrieved 27 November 2017. ^ a b Gonzalez-Polledo 2016, p. 5. ^ Alhaboby et al. 2018, p. 177; Conrad 2017, p. 84. ^ Werber, Cassie (31 July 2017). "Spoons Have Become a Powerful Symbol of People's Invisible Pain". Quartz. Retrieved 28 November 2017. ^ Alhaboby et al. 2018, p. 177. ^ Brune & Wilson 2013. Alhaboby, Zhraa A.; Barnes, James; Evans, Hala; Short, Emma (2017). "Challenges Facing Online Research: Experiences from Research Concerning Cyber-Victimisation of People with Disabilities". Cyberpsychology: Journal of Psychosocial Research on Cyberspace. 11 (1). Art. 8. doi:10.5817/CP2017-1-8. ISSN 1802-7962. ——— (2018). "Disability and Cyber-Victimization". In Schatz, J. L.; George, Amber E. The Image of Disability: Essays on Media Representations. Jefferson, North Carolina: McFarland & Company. pp. 167ff. ISBN 978-1-4766-6945-8. Brune, Jeffrey A.; Wilson, Daniel J. (2013). Disability and Passing: Blurring the Lines of Identity. Philadelphia: Temple University Press. ISBN 978-1-4399-0979-9. JSTOR j.ctt14bt3q0. Conrad, Sarah (2017). "Consider the Spoons: An Embodied Relational Approach to Incorporating Those with Persistent Fatigue into Eco-Activism". In Nocella, Anthony J.; George, Amber E.; Schatz, J. L. The Intersectionality of Critical Animal, Disability, and Environmental Studies: Toward Eco-Ability, Justice, and Liberation. Lanham, Maryland: Lexington Books. pp. 79–97. ISBN 978-1-4985-3443-7. Gonzalez-Polledo, Elena (2016). "Chronic Media Worlds: Social Media and the Problem of Pain Communication on Tumblr". Social Media + Society. 2 (1). doi:10.1177/2056305116628887. ISSN 2056-3051. Lashley, Felissa R. (2003). "A Review of Sleep in Selected Immune and Autoimmune Disorders" (PDF). Holistic Nursing Practice. 17 (2): 65–80. doi:10.1097/00004650-200303000-00002. ISSN 1550-5138. PMID 12701994. Retrieved 27 January 2016. Gonzalez-Polledo, Elena; Tarr, Jen (2016). "The Thing About Pain: The Remaking of Illness Narratives in Chronic Pain Expressions on Social Media". New Media & Society. 18 (8): 1455–1472. doi:10.1177/1461444814560126. ISSN 1461-7315. Retrieved 10 November 2018.